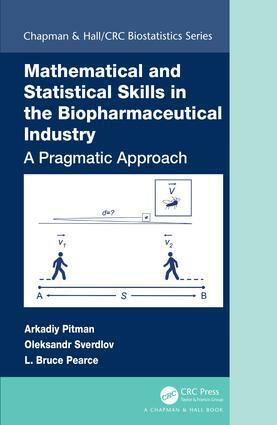 Mathematical and Statistical Skills in the Biopharmaceutical Industry: A Pragmatic Approach describes a philosophy of efficient problem solving showcased using examples pertinent to the biostatistics function in clinical drug development. It was written to share a quintessence of the authors’ experiences acquired during many years of relevant work in the biopharmaceutical industry. The book will be useful will be useful for biopharmaceutical industry statisticians at different seniority levels and for graduate students who consider a biostatistics-related career in this industry. Describes a system of principles for pragmatic problem solving in clinical drug development. Discusses differences in the work of a biostatistician in small pharma and big pharma. Explains the importance/relevance of statistical programming and data management for biostatistics and necessity for integration on various levels. Describes some useful statistical background that can be capitalized upon in the drug development enterprise. Explains some hot topics and current trends in biostatistics in simple, non-technical terms. Discusses incompleteness of any system of standard operating procedures, rules and regulations. Provides a classification of scoring systems and proposes a novel approach for evaluation of the safety outcome for a completed randomized clinical trial. Presents applications of the problem solving philosophy in a highly problematic transfusion field where many investigational compounds have failed. Discusses realistic planning of open-ended projects. SAS Certification | Is it worth time and efforts? Why do we need basic knowledge of the Macro language? Background assessment: what do we start with? Are we finished? Not in the regulatory setting! 7 Can One Predict Unpredictable? First, what can we do? Arkadiy Pitman, MSc is senior director of biostatistics and data management at HBO2 Therapeutics. His experience includes over 20 years of teaching mathematics, logic, statistics, and computer science, as well as over 20 years of work in US small pharma environment, covering data management, statistical programming, biostatistics, regulatory, and medical writing. Oleksandr Sverdlov, PhD is neuroscience disease area lead statistician in early clinical development at Novartis Pharmaceuticals. He has been actively involved in research on adaptive designs for clinical trials and edited a monograph Modern Adaptive Randomized Clinical Trials: Statistical and Practical Aspects (CRC Press). L. Bruce Pearce, PhD has background in pharmacology and toxicology. Since 2009 he has served as a consultant to very early and late stage biotechnology and pharmaceutical companies for the development of small molecule-based drugs, biotechnology-derived natural and recombinant biotherapeutics, and medical devices.